I wrote this script for one of our L1 support team where they create mailboxes manually. Lately, the customer where this team works wanted to the POP/IMAP services to be enabled and have the POP/IMAP access disabled on mailbox level. To help them out I decided to help them with a GUI that can handle these two tasks right at the time of mailbox creation itself. This is an initial version of this script and I am still working on adding few more features, and validations in it. Your feedback on this one will help improving it. So, please feel free to leave a comment or write to me. 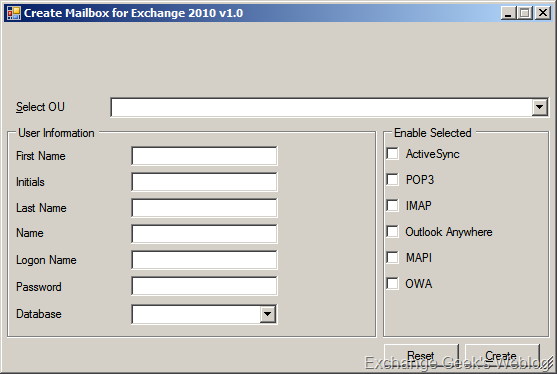 This script will work only with Exchange 2010 and has to be executed from Exchange Management Shell only. This entry was posted on 13/11/2011 at 7:20 PM	and is filed under Exchange 2010. You can follow any responses to this entry through the RSS 2.0 feed. Both comments and pings are currently closed.